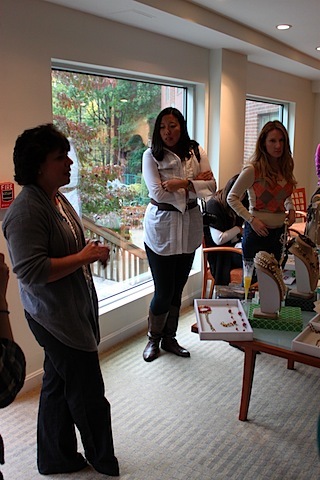 Stella & Dot Trunk Show... and a GIVEAWAY! Stella & Dot Trunk Show… and a GIVEAWAY! So naturally, when Jo-anne contacted us and explained the history of the company and that Stella & Dot was huge out on the west coast and expanding to New England, we were intrigued. Two women started the company. One was the founder of WeddingChannel.com (which was later bought by theknot.com) and the other was a creative director for J.Crew and Banana Republic. These women clearly have good taste and we knew we were in good hands. 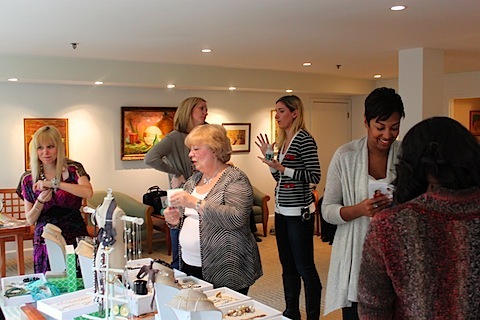 This past Sunday a lovely group of friends, family, and some Boston bloggers got together in the community room at Sues’ apartment building for a brunch and jewelry viewing party. 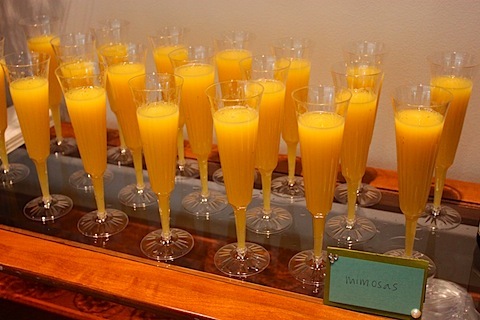 Because who doesn’t love sipping a mimosa while trying on countless amounts of sparkly thangs? 😉 Not a friend of mine, I can tell you that much! We decided to have a nice spread of food (surprise, surprise!). But between Project Food Blog and working in Chicago last week, Sues and I were definitely crunched for time so Sues’ mom kindly offered to make quiche for the party. Which were absolutely fantastic! 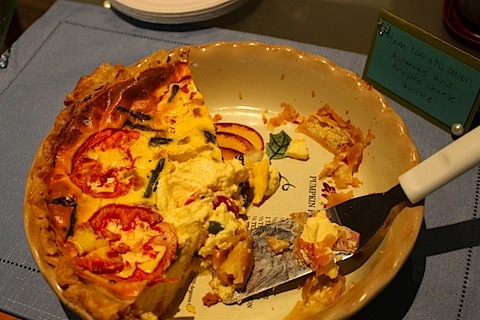 She made a ham, tomato, onion, asparagus, and Gruyere quiche and a spinach, mushroom, onion, and Monterrey Jack quiche. Dreams of these will be had. And we loved the cucumber chive cups we made for round 6 of Project Food Blog that we decided to make more for our party. 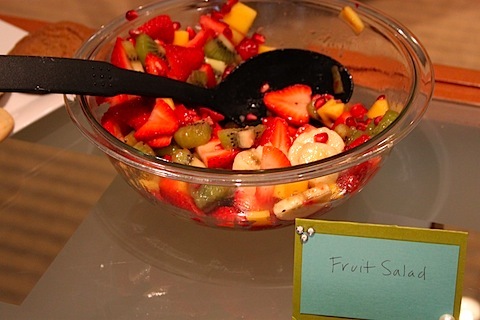 A pretty fruit salad always works at any brunch related gathering! And now for the main attraction… the jewels! Jo-anne was truly a great stylist. From the very beginning of the planning process she answered all of our emails promptly, sent out our invitations, and just handled everything so professionally. 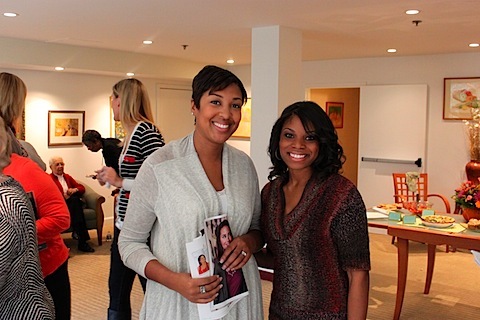 The thing I liked best about the Stella & Dot party was that they’re not pushy. Jo-anne set her display up, answered questions as needed, and was very hands-on, but she in no way broke up the flow of the party. 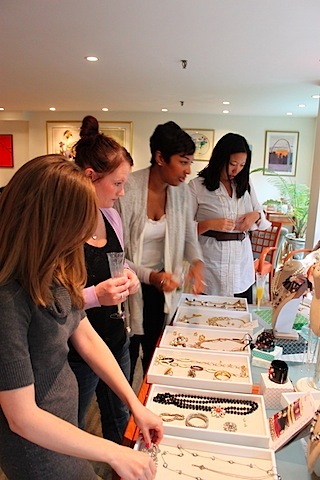 We’re always a little weary of organized product parties because your guests can often feel pressured to purchase large amounts of merchandise but Jo-anne took the backseat and allowed the jewelry to speak for itself! 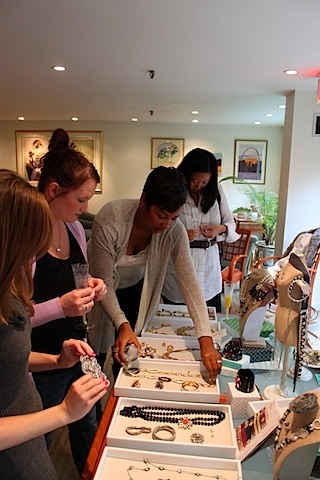 Our guests were all encouraged to pick up the jewelry and try it on, too. Pretty sure I kept this necklace on the entire afternoon 😉 We each had lots of favorites! 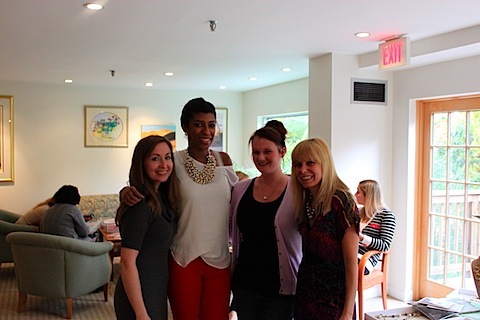 It was really such a great afternoon filled with the wonderful ladies in our lives! My grandmother was visiting for the weekend… Hooray! 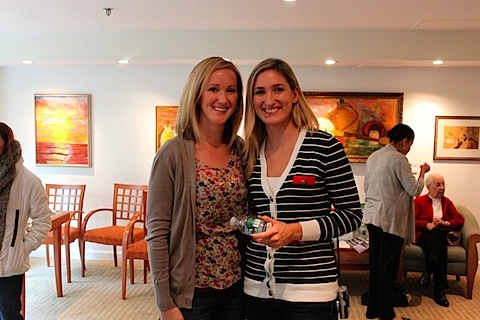 Here she is with my sister and my sister’s friend Kristen. 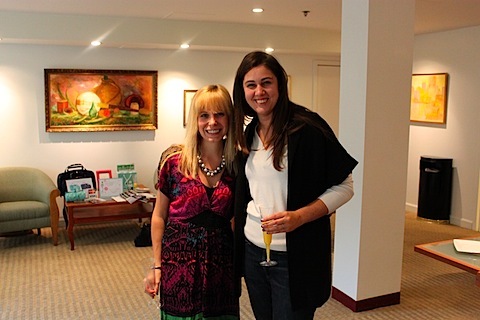 Sues with Kyle, who sold her greeting cards at the party, too! My sister with her friend Kristian! If you’d like to shop online to place your order and be entered into the giveaway, you must click here, and under “find your hostess” type “we are” for the first name and our trunk show page will show up for you to start shopping… Simple as that! Jo-anne is keeping track of all of your entries and we’ll randomly select a winner early next week. And again, for your entry to count for the giveaway you must purchase through our extended trunk show. Also, if you’re local and are interested in booking your own Stella & Dot party you can contact Jo-anne, just tell her We are not Martha sent you! 29 Responses to "Stella & Dot Trunk Show… and a GIVEAWAY!" looks like a great time! i was bummed I couldn’t make it… silly puppy :/ did you guys have a favorite piece?? Susie’s mom made the most amazing quiche! I had so much fun. Looks like a great time. I was bummed I couldn’t make it. What did you guys end up ordering? Um, I look PISSED as I’m listening…I swear I wasn’t! 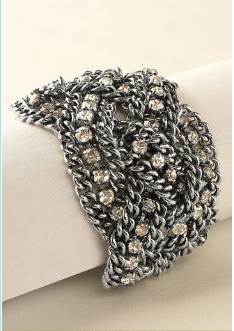 I’m looking forward to my Stella & Dot purchase arriving today! 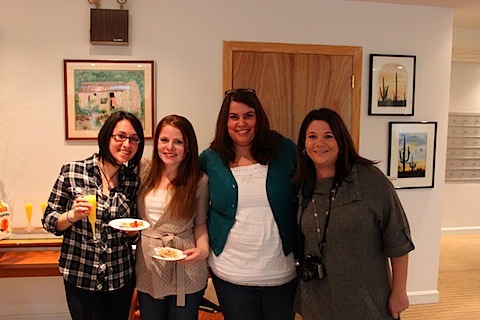 Thanks again for inviting me ladies! Great party! 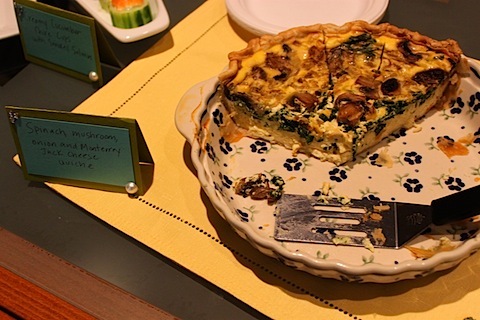 The quiche looks super tasty. And I always get excited when there is a giant bowl of fruit salad at a party. The jewelery looks pretty too. I’m so bad about accessorizing- I need to work on this. I wonder if they have plans to expand down south too? 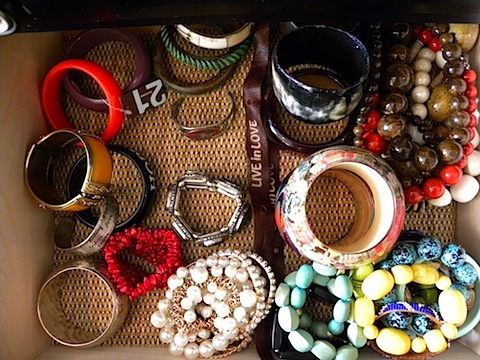 your jewelry drawer is so cute! 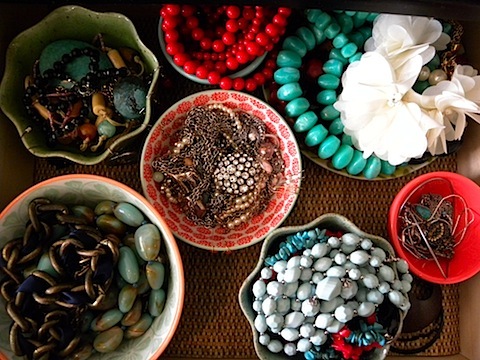 love how you have the necklaces stored in little dishes. looks like a super cute show with some beautiful pieces! It was absolutely my pleasure bringing our boutique to you and your friends! 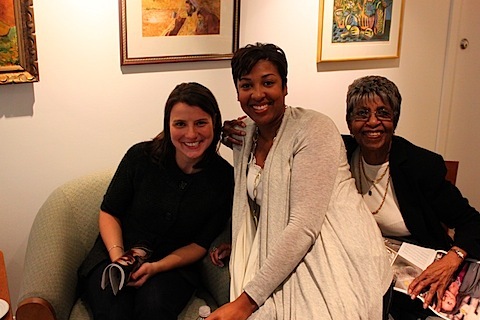 I had a great time and it was so wonderful to meet all of you. Looks like such a fun afternoon! I love brunch and jewelry as well. Your drawer organization is inspiring me to make-over my dresser soon!! You guys are adorable! This looks like such a fun party, and I LOVE all your cute labels for the food, what a great idea so you don’t have to keep telling people what everything is! This looks like a fabulous party! I’m so sorry I missed it. I had my boyfriend’s 40th on Friday night and a concert on Saturday night, so I assumed (correctly) that I’d be dead to the world on Sunday. I barely left the house all day. 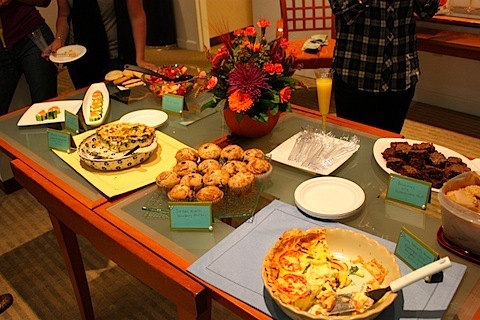 The quiche looks so delicious, as does the rest of the spread and those mimosas. okay, clearly i live in the wrong city. I need to party withyou divas. seriously. Adorable. Looks like so much fun. I will admit I’ve always been intimidated by shopping parties because I worried I’d be pressured to buy something, but your party looks fantastically fun and low key. 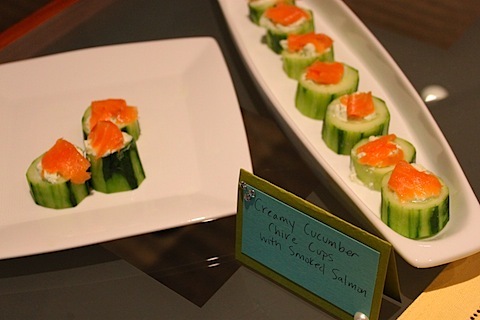 I want to make your cucumber cups! I am guessing you make a little well, or a shallow bowl in them and put chives and cream cheese? Looks so good!!! Whoa what a great opportunity! Good food, good friends, pretty jewelry. It’s basically a girls’ paradise. It looks like you had a wonderful time! I wish I had money to buy more jewelry. It’s such an easy way to completely change an outfit! it was such a fun party, girls! can’t wait to get my jewels! 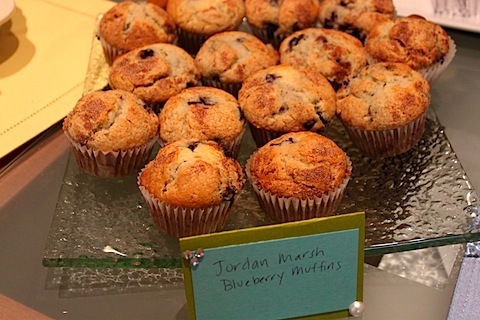 What a yummy spread and super cute jewelry – so sad I couldn’t make it. Have you heard about Bamboopink by Jude Frances? 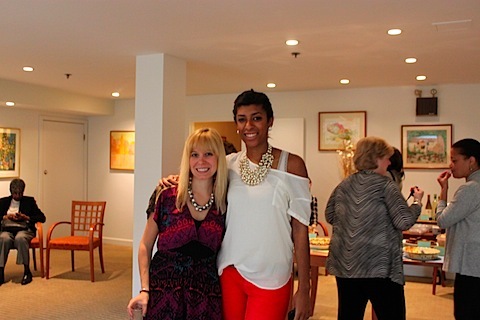 A fabulous new jewelry line that will be sold through direct sales. I saw your blog about Stella & Dot and thought you might be interested. I can send you press releases, recorded conference calls, etc. The company is offering FREE signups through March 15 and I’m sure some of your readers would love this chic, affordable jewelry line. My signup page is http://www.bamboopink.net/dallas. Please email me if you are interested.